The recent tourism boom on Skye has been well-documented and is offering a welcome boost to the island’s economy. However, Galbraith believes that there is a misconception that Skye is overwhelmed by hordes of tourists on a daily basis, which is far from correct. Indeed, the majority of the island retains its peace and tranquillity and offers a wealth of beautiful locations to set up home. Skye is one of the most beautiful parts of Scotland, with the dramatic mountain scenery including the Cuillins and MacLeod’s Tables, the stunning and unspoilt coastline, and inland forests and moorland, all combining to make the isle a truly unforgettable destination. Tourists visit the many attractions such as the Fairy Pools, Dunvegan Castle and The Old Man of Storr, but away from these popular centres the island is peaceful and community-centred, its unspoilt landscape providing a habitat for many rare native species of wildlife and where hidden coves and beautiful walks are known only to the locals. It is still possible to find many beautiful and wild parts of Skye which would be ideal for a second home or a permanent residence, offering an excellent outdoor lifestyle. The individuality of the island brings with it a particular dynamism and vibrancy offering a significant long-term attraction for those setting up a home or business here. The economy of the island is thriving and its innate progressive approach with good communications and easy accessibility to the mainland create an ideal environment to encourage and grow business. Successful architects, designers, restaurateurs and extreme sports men and woman have taken inspiration from the island to rise to the top of their fields and take the excellence of the island to a world wide audience. Two house plots on the Sleat peninsula, known as ‘the garden of Skye’ and one of its loveliest and most accessible parts. 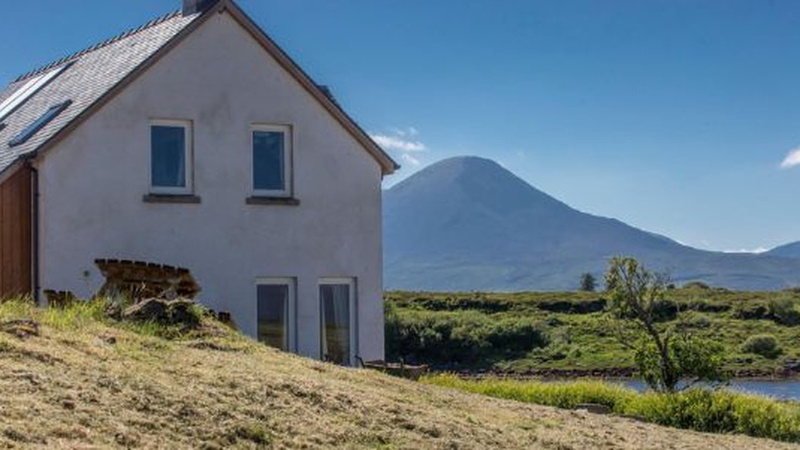 The sites are close to the village of Ardvasar, in a beautiful south facing setting with the backdrop of the community owned Tormore forest and with spectacular views over the Sound of Sleat to Rum, Eigg and the white sands of Morar. The sites are being sold by the Sleat Community Trust, established to support sustainable economic, environmental and social development in the Sleat Peninsula. Dunneill is a beautifully presented family home in an elevated position with panoramic views over the Sound of Sleat. Sleat, which lies at the southern end of the island, is one of the most peaceful areas of Skye and is easily accessible from the Skye bridge. Four bedrooms, two reception rooms. Well-appointed accommodation with a light filled interior. A highly energy efficient contemporary family home with four bedrooms and three reception rooms in a stunning coastal setting. The house has a ground source heat pump, solar panels and income generating photo-voltaic panels. Its spectacular setting on the shores of a tidal inlet is unmatched, and the property has with direct access to the foreshore. Holiday letting business potential.